G'MIC - GIMP Plugin With 230+ Image Effect and Filter. G'MIC (GREYC's Magic for Image Computing) is an open and full-featured framework for image processing, providing several different user interfaces to convert/ manipulate/ filter/ visualize generic image datasets, from 1d scalar signals to 3d+t sequences of multi-spectral volumetric images. GIMP Plugin called G'MIC has predefined preset for image processing along with flexibility for creative applications. It has a very lightweight core that is mature code and comes with a complete set of manipulation and filter commands which operate on a stack of images. G'MIC has been made available as an easy-to-use plug-in for GIMP. It extends this retouching software capabilities by offering a large number of pre-defined image filters and effects. Of course, the plug-in is highly customizable and it is possible to add your own custom G'MIC-written filters in it. GREYC's Magic Image Computing (G'MIC) provide important functionalities for image retouching tool which has been made available as a GIMP plugin. G'MIC comes with a large number of pre-defined image filters and effects (more than 230) and works on Linux, Windows and Mac OS. After download completed, extract to the GIMP's plug-in directory is usually located at $HOME/.gimp-2.x/plug-ins/. Once installed, start GIMP, import an image and go to Filters > G'MIC (G'MIC won't show up if no image has been imported). The plug-in requires these libraries installed on your system: libfftw, libfftw_threads, libpng, zlib. Use your package manager to fit these dependancies. G'MIC is focused on the design of possibly complex pipelines for converting, manipulating, filtering and visualizing generic 1d/2d/3d multi-spectral image datasets. This includes of course color images, but also more complex data as image sequences or 3d(+t) volumetric float-valued datasets. G'MIC is an open framework: the default script language can be extended with custom G'MIC-written commands, defining thus new image available filters or effects. By the way, it already contains a substantial set of pre-defined image processing algorithms and pipelines (more than 1000). G'MIC has been designed with portability in mind, and runs on different platforms (Windows, Unix, MacOSX). It is distributed under the CeCILL license (GPL-compatible). Since 2008, it has been developed in the Image Team of the GREYC laboratory, in Caen/France, by permanent researchers working in the field of image processing on a daily basis. GIMP Best Photoshop Alternative in Linux + GIMP Review. For you who use Photoshop, in Linux there is a program which similiar to Photoshop called GIMP (GNU Image Manipulation Program). This Photoshop compatible linux is a freely distributed piece of software for such tasks as photo retouching, image composition and image authoring. It works on many operating systems, in many languages. GIMP is Photoshop for linux mint which can be downloaded for Linux Mint and Ubuntu. Photoshop for linux alternative, GIMP available for a variety of operating systems including Mac, Windows, and Linux. 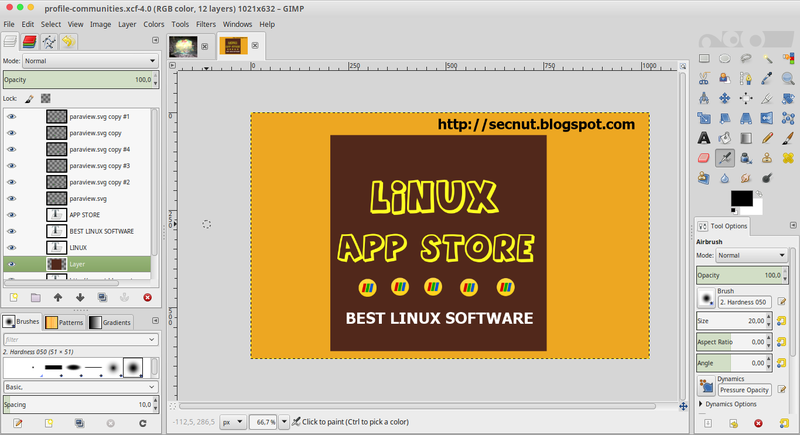 Because of GIMP is the Best Photoshop Alternative in Linux. GIMP program installed by default in Linux Mint, so you don't need to install GIMP. 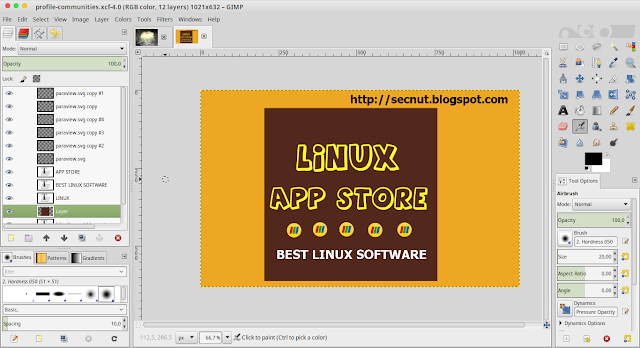 GIMP Review - Best software to design poster in Linux. You can also design any banner, editing image exported to various format. The tools are laid out as one would expect for this type of app. The UI has a modern look and feel to it. And best of all, you can switch to Single-Window Mode, a feature many people were eager to get. To activate "Single-Window Mode" in GIMP: Open GIMP, click on the Windows >> Single-Window Mode. Please make sure the window mode is chechked. GIMP can be used as completely replace Photoshop for Linux, the menu, tools, and preset that have same functionalities to Photosphop. The file format support ranges from the common likes of JPEG (JFIF), GIF, PNG, TIFF to special use formats such as the multi-resolution and multi-color-depth Windows icon files. The architecture allows to extend GIMP's format capabilities with a plug-in.